The SwiftKey team at Microsoft has rolled out another new update to the SwiftKey for Android app. The update, version 7.0.3.19 for those keeping score at home, brings support for five new languages, Alsatian, Fongbe, Norman, Urdu (English), and Warlpiri, as well as several bug fixes to the keyboard alternative for Android phones. With the addition of Alsatian, Fongbe, Norman, Urdu (English), and Warlpiri, SwiftKey for Android now supports well over 200 languages natively, making it one of the most language diverse apps in the Google Play Store. SwiftKey, the Microsoft keyboard alternative for Android, has a new minor update rolling out that brings the ability to instantly share your location when using the keyboard. The update, version 7.0.1.21 for those keeping score at home, is rolling out now in the Play Store. Once you have this new version installed on your phone, you will have the ability to share your location while using the keyboard. Sharing your location will share the current address of your location with whomever you are texting messaging while using the keyboard. There is a new update to Microsoft’s SwiftKey keyboard app rolling out today in the Play Store. The update, version 6.7.8.25 for those keeping score at home, brings support for nine new languages as well as a number of bug fixes. It also brings support for Hiragana layout for Japanese language users. As for the new languages, users of SwiftKey now have these new ones available: Afar, Banjarese, Fulani, Gayo, Guarani, Madurese, Minangkabau, Nias, Bengkulu. That brings the total number of languages supported by the keyboard app to well over 200. 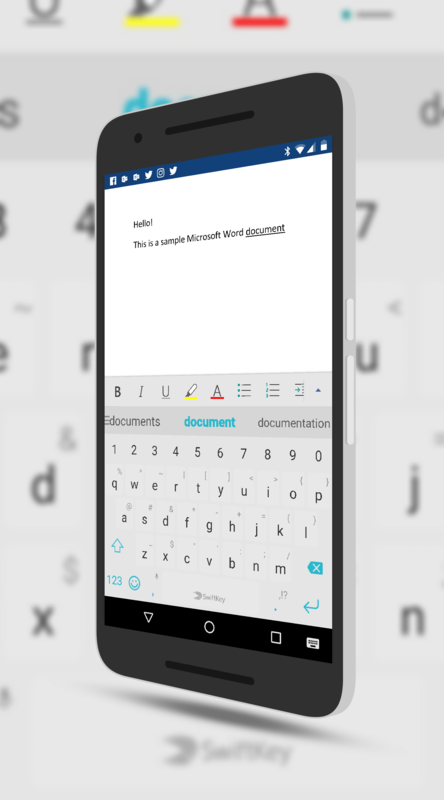 The popular keyboard app SwiftKey has a new update rolling out in the Play Store today. The update, version 6.6.9.32 for those keeping score at home, is primarily a performance and bug fix release but there are a couple of new features of note too. First, the app now supports signing in and synchronizing of your learned words and typing patterns with your Microsoft account. Support for Google and email sign-ins have been support for some time now but not for those who prefer to use their Microsoft account. Why is this a big deal? Because Microsoft owns SwiftKey. They bought the company in February 2016 so it seems odd that it took this long to bring support for their own accounts to their own apps. SwiftKey, the powerful keyboard app that introduced Artificial Intelligence learning in a keyboard app, has a new update rolling out in the Play Store. The update brings the normal set of behind-the-scenes updates and performance improvements but it also brings new languages. In all, 7 new languages have been added to SwiftKey, bringing the total number of supported languages up to 205. Here are those new languages. In addition to the new languages, transliteration support for Sinhala & Dhivehi has also been added in this update. SwiftKey, one of the more popular keyboard apps for Android, has received a sizable update that brings improved Flow typing predictions to your phone. The Microsoft owned SwiftKey will now give you three predictions as you type or use Flow, the swiping across the keyboard to spell words. As you type, the center word is highlighted and will be automatically inserted as you begin typing the next word. If, however, that word is not correct, you can tap the left or right word next to it for it to be inserted. Previously it would only insert whatever word it though you were typing which caused users to have to backspace to type in the correct word. app. If you want to have sound with keypresses, you can now choose from Modern, Android, Traditional or Blip. Previously only Traditional was available. While Google’s GBoard has been getting the lion share of attention these past few months, rightfully so, SwiftKey has been doing a lot of what GBoard does for a long time. It also has some 250 million users globally which shows its stamina. If you haven’t tried it out, it is free and available in the Play Store.